As travel becomes faster, cheaper and less personalized, slow-travel becomes one of those hidden luxuries. Train travel is very much about slow travel. There is time to sit and watch the passing surrounds of hills, villages and valleys. It is time simply to absorb, relax and breathe. It is also an opportunity to look at your new surrounds with fresh eyes and ears. You may even catch yourself thinking. Travelling is a very personal thing, and so is packing. For those of you who have mastered this unique art, well done! To the others (and I include myself in this category),why not take a leaf out of Marie Kondo’s book ‘The Life Changing Magic of Tidying Up’?She devised the famous KonMari Method and is a pro organiser with a minimalist inspired approach to tidying. *Check out her 6 basic rules for decluttering your home below. I have discovered that the KonMari method is also perfect for packing. Simply take out any item that doesn’t bring you joy when you make your final pack, and hopefully this will lighten your luggage. maneuver to get to platforms. 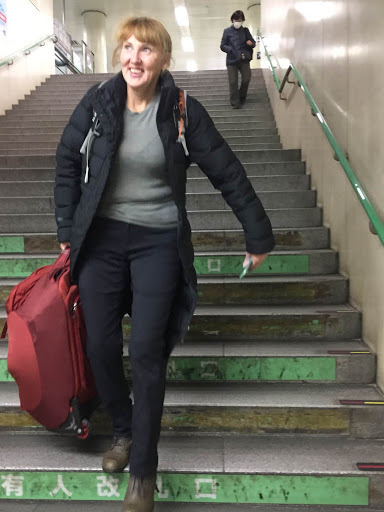 Once I was on the train I discovered that the luggage storage was usually overhead (particularly on the Shinkensen or bullet trains) and I needed to be able to do this myself rather than relying on the kindness of strangers (Japanese people are reserved and don’t usually offer to help). It is a struggle either way, but less of one if your bag is light. On the first trip I had 17kgs which was too heavy and during the second trip I had reduced it to 14kgs, which was about right.One of my travelling companions on my first visit had a suitcase of around 25kgs. This person was a novice traveler and we all nearly broke our backs juggling to pick it up to store it overhead. He ended up buying another bag and splitting the contents. I have discovered that aiming to sit around 15kgs is a good rule of thumb. Travelling further afield to India, if you are taking an internal flight to a regional area (e.g. Delhi to Dharamsala), the airlines will restrict your check in luggage to 15kgs and usually charge for each kilogram over 16kgs. This can become a costly addition to your holiday if you are taking a few of these internal flights. 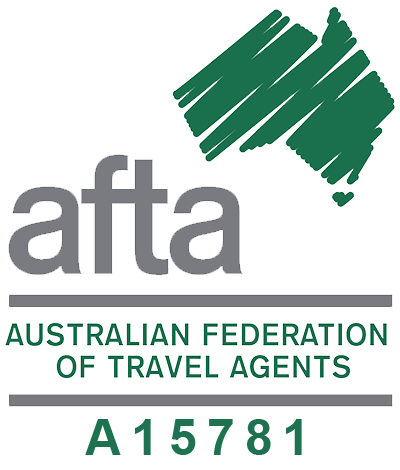 The same applies for domestic flights in Australia – if you learn the art of packing lightly then there is no need to pay for luggage (e.g. when flying on Jetstar) and the bonus of not having lengthy delays waiting for bags. From my years of travelling, I have discovered that having less weight to carry around on the road saves your back and your head if you have your suitcase carefully coordinated. I prefer travelling in winter and this has a distinct advantage. You don’t sweat – so that means you can wear the same thing more than once. Rotating different tops and bottoms along with colourful scarves also means that you never get bored. Scarves, shawls and sarongs are great multipurpose travel items and can be used for so many things – to provide warmth, as something to sit on, an emergency towel or blanket or to cover up when visiting religious sites. Wool underwear is another amazing addition as it dries quickly overnight. Summer it is a bit different but does have one advantage as you can also get wash and wear outfits that you can wash at night time and hang out to dry under some tropical night sky. I completely understand why Marie Kondo is so famous. Next time you are about to set off on that holiday you have been so eagerly awaiting, pick up every piece of clothing that you are thinking of taking and if it doesn’t bring you joy (or practicality) leave it at home. It is definitely a case of less is best. I am certainly going to try this approach, having just booked myself a flight for 5 days with carry-on luggage only. The minimalist approach to packing lightly is an art form and something I am embracing, and I hope you will too. *What is the KonMari Method? 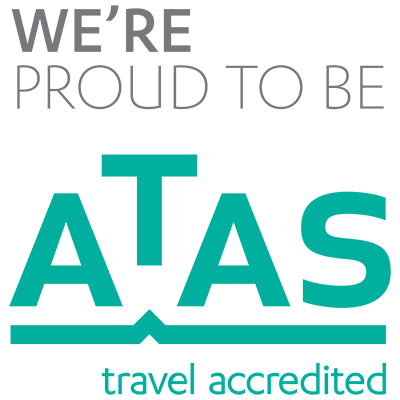 We are excited to announce the introduction of a new service – unique ‘Meet Your Insider’ sessions, facilitated via Zoom for a our clients. These individual sessions may help you to decide if a trip is for you and is an opportunity for you to get to know your insider guide. We will publish a time once a month starting in April for anyone wishing to take a trip to India, Japan or a bespoke experience in Australia please let us know if you want to join us so we can send you the link (it will be early evening in Australia). You will get to meet Vikas, our insider in India. Vikas is our Tour Manager in India and has been guiding tours since 2011. He starting as a trekking porter then guide whilst he was at school, leading people in the Indian Himalayas and he is passionate and knowledgable about the area. 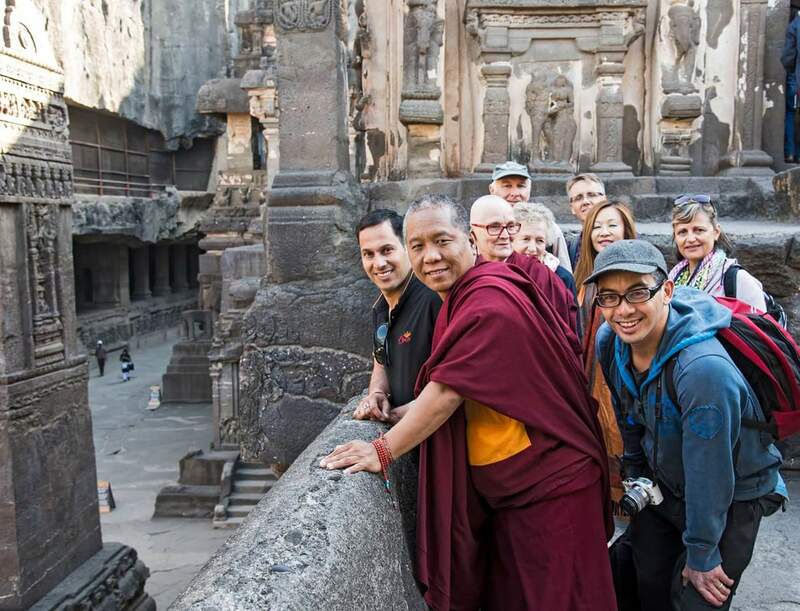 Since then he has lead many tours throughout India including women’s and photographic groups, Buddhist Pilgrimages and specialist trekking groups. Vikas grew up in Dharamsala and still lives and works there with his family. Sharon’s life has been consumed by travel. 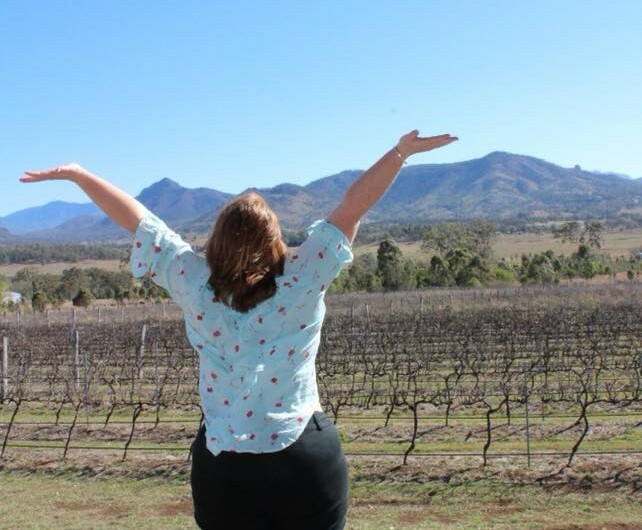 She got her first insider experience travelling in her home country of Australia, and after this taste of life on the road she set off further afield and spent many years living and working in New Zealand, England and Scotland. 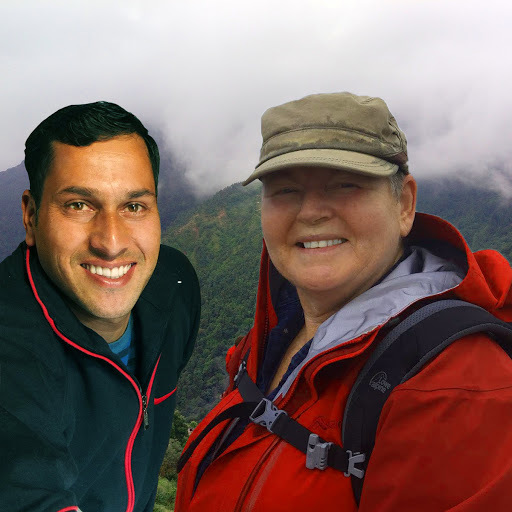 Sharon then spent several years volunteering in the Himalayas – both in a rural village in Nepal and in Dharamsala, India; the home of the Dalai Lama. 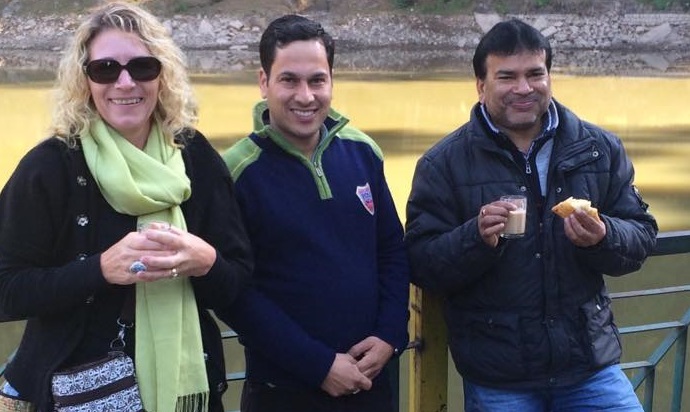 It was in Dharamsala that Sharon started her travel business – she was an insider in India and wanted to share her knowledge and passion with others. 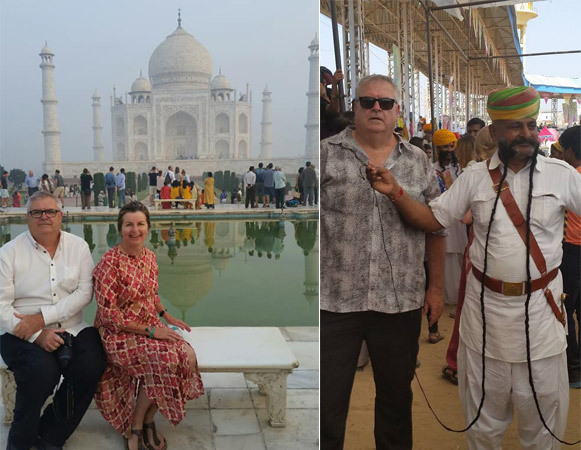 Nowadays Sharon splits her time between India and Australia, and continues to share her vision of life as an insider as the business manager of Ekno Travels. 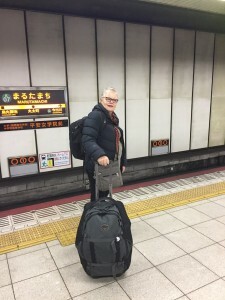 Sharon leads tours in India, Australia and Japan; with a unique focus on Buddhist pilgrimages and walking tours. 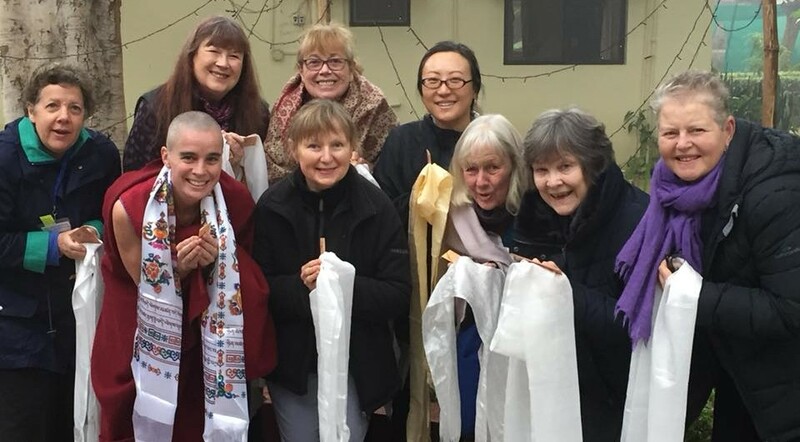 Sharon currently enjoys volunteering at Chenrezig Buddhist Institute doing what she loves best, facilitating creative writing courses with a unique Buddhist perspective. Pilgrimages are a part of nearly every religion. When followers set out there is a hope of finding virtue and gaining merit. For Buddhists, they visit places where a spiritual master once spent time, where he taught or meditated and his presence is felt often by those who visit that very place. 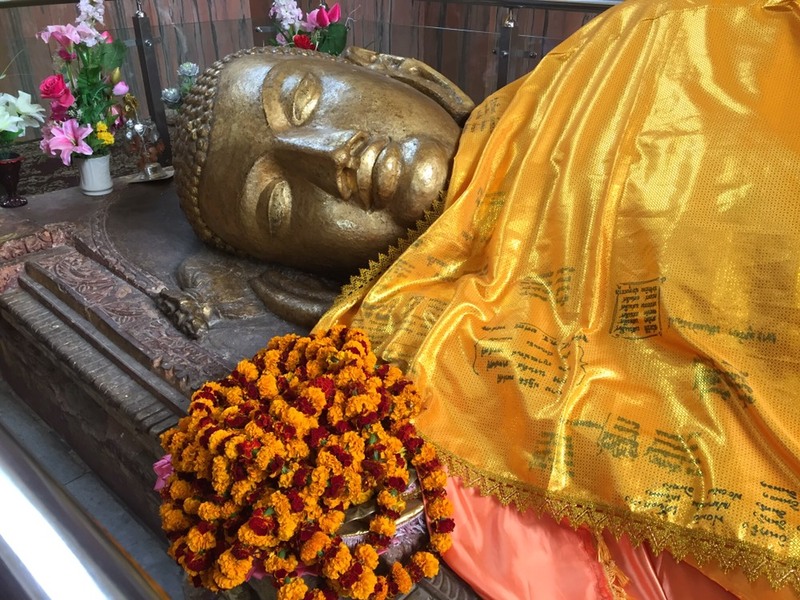 I have been on and lead many pilgrimages mainly in India and find them particularly powerful events, particularly in Bodhgaya, where the Buddha found enlightenment 2,500 years ago. He meditated under the Bodhi Tree at Mahabodhi Stupa and became enlightened. This is the most sacred place in the world for Buddhists and you can feel it is a very special place with Buddhists from around the world walking around in a clockwise manner. It is a memerising experience as Buddhists believe that merit is accumulated when you take undertake a pilgrimage. 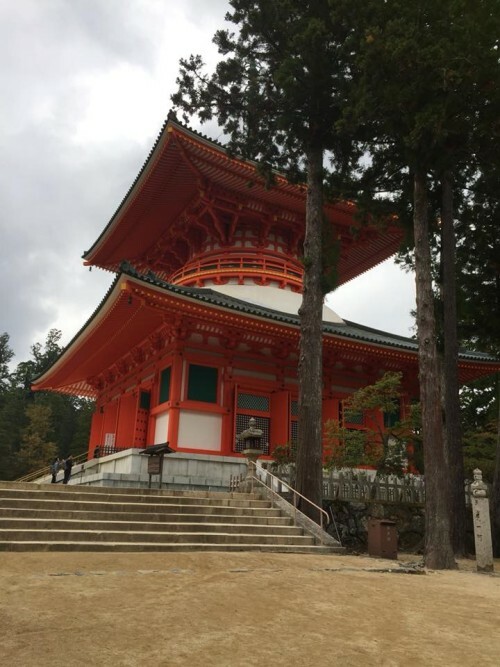 So when the idea came that it would also be a worthwhile to undertake a pilgrimage to Japan, the home of another sect of Buddhism, Shingon Esoteric. I asked my good friend and co leader in many pilgrimages, Ven Kartson from Chenrezig Institute. The dates we decided were 12-22 October this year. We all met in Osaka – 5 of participants – Rob, Pam, Phil, Lesley and Paula and Yaki and I. We met at our hotel and found a small restaurant in the downtown area to get to know each other. We sat outside on the footpath and there was a distinct chill in the air. 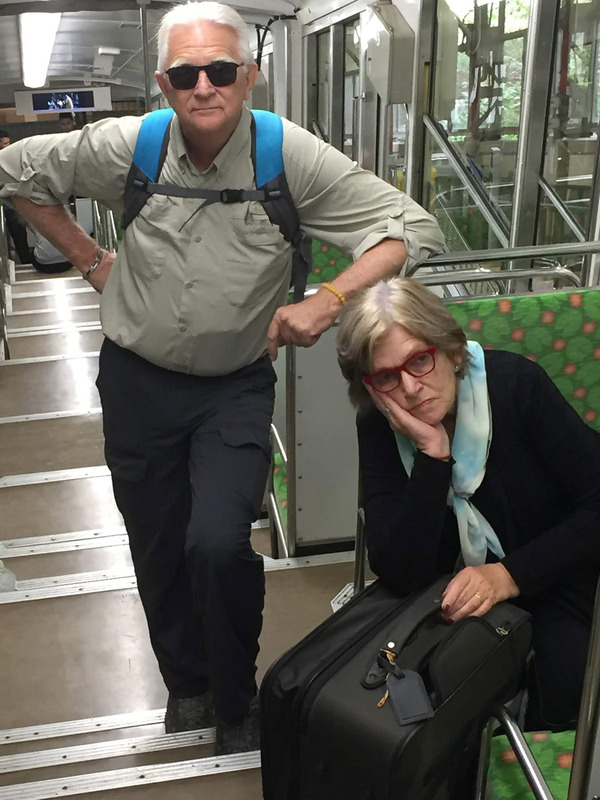 We got down to business the second day, heading to Nara by train with our guide. 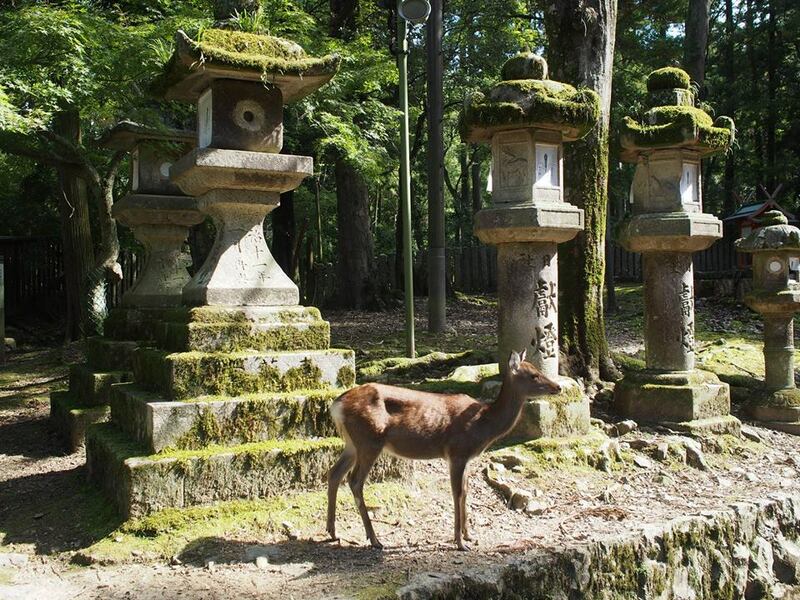 Nara is the old capital and is the most sacred place in Japan for Buddhists. I was blown away as soon as I walked through the gates by all the moss covered tōrōs (traditional lantern made of stone) that lined the walk way up to the main temple of Todai –ji. Its Daibutsu-den (temple) is the largest wooden building in the world, housing a spectacular 16-metre tall image of the Rushana Buddha in bronze and gold. The main attractions however were the deer that roam around the park. They were very friendly and cute and we couldn’t stopped ourselves being the ‘patting the deer’ tourists. We also witness a wedding in one of main Shinto temples. It seemed very special to be quiet observer. Returning to Osaka we had time to take in the beautiful Osaka Castle. As we were there late got to witness the beautiful evening shadows of the surrounding grounds. What a picture it was. Our next destination was Koyasan . The journey to get there was full of anticipation as we had to get a train from Osaka, a cable car then a bus to our destination, a Shuboko (a temple) in the town where we were spending 2 nights. We were fascinated by the cable car, run very efficiently and safely as most things are in Japan. Every detail is attended to, a man in a immaculate blue uniform wearing white gloves was at the helm. It was thrilling heading straight up the mountain almost vertically. The town of Koyasan turned out to a beautiful little town sitting high in the mountains quaintly amongst many large trees. The town felt old, very old. Our accommodation at the temple stay were large tsumati rooms with beautiful bedding folded in the corner. A Yakata and jacket pristinely pressed was folded up in the other corner complete with a round tray with cup and a pot of green tea. Dinner turned out to be equally fastidiousily prepared and we have around 10 different dishes on our trays all of which you wanted to eat mindfully as it was so beautifully presented. Japan has its own temple food Shojin Ryori, which is the traditional dining style of Buddhist monks. It grew in popularity with the spread of Zen Buddhism in the 13th century. As the cuisine is made without meat, fish or other animal products. The founder of Mt Koya was Kobo Daishi Kukai (774-835) a Japanese monk, and the son of a regional aristocratic family in the southern island of Shikoku. In 815 Kobo Dashi was granted the area of Koyasan by the Emperor at the time to build a monastery. The monastery still flourishes 1,200 years later and we had the good fortune of visiting the monastery whilst staying in Koyasan. It was a beautiful old monastery and one got the sense that it was significant not only for the historical perspective but for the amount of care paid to the raked stone garden and the volunteers who took loving care of the place. Kobo Dashi is buried in a large mausoleum at the cemetery close to town along with 200,000 other monks and feudal lords. The cemetery is full of tombstones which are a mixture of stone statues with faces and others without. Some which have had their faces painted and wearing red hats and bibs and were very life like in some cases. It is one of the main attractions of Mt Koyasan and no visit is complete without a walk through this large area of dead souls. We were invited to the fire ceremony early the next morning which consisted of monks and nuns chanting, praying while feeding a small fire with wood. An English speaking monk came and welcomed us, explained about the ceremony and then invited us to breakfast. Breakfast turned out to be as elaborate as dinner the night before. The flavours and presentation as exquisite as the night before. Heading down the hill, our cable car journey was still as thrilling as the one of the way up. We were on our way to Kyoto where more adventures were in store. As we were travelling the whole journey by train, we were on and off local trains then a fast intercity to Kyoto. It is always amazing after living in Australia where everything is so far away, and in India where everything is so slow, the speed and lack of distance is a delight. It feels like being in a time capsule. There is so much to see in Kyoto, where to start? We find our hotel, settle in and time to meet our guide, Tomoko. 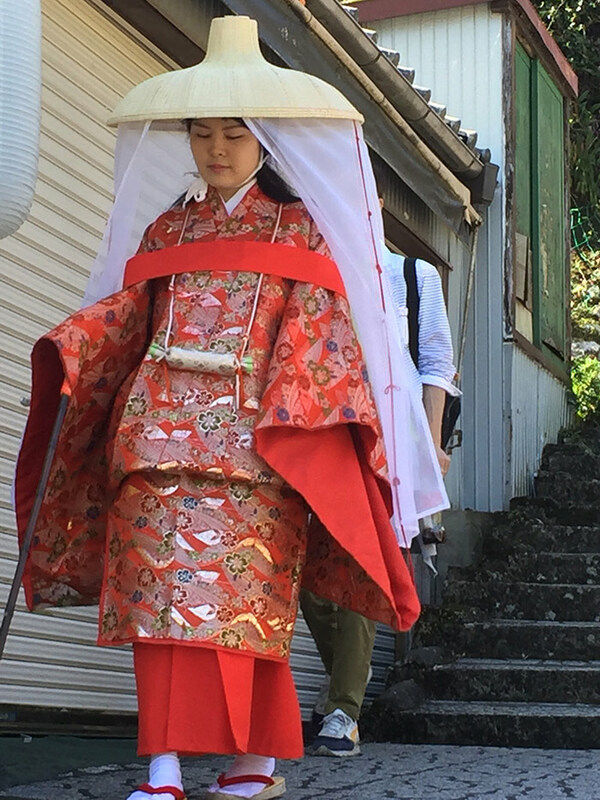 She is a delight, friendly and leads us to the nearest bus stop on our way to Higashiyama is Kyoto’s most popular sightseeing district. We take in some of the city’s most famous highlights, starting near Sanjo-dori Street and we walk to Shoren-in Temple. Then, we enter the vast Pure Land temple of Chion-in and enter the garden there, which few tourists visit. Bring back memories of Mt Koyasan, we head through the graveyard before heading up to the awe-inspiring bell of the temple. 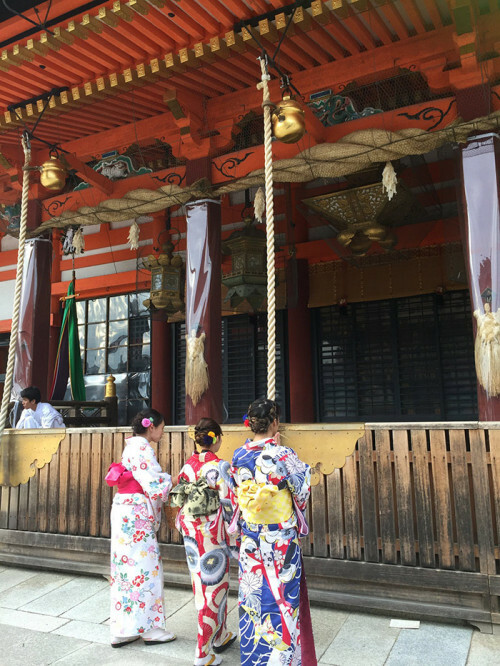 As we head into the picturesque Maruyama-koen Park and continue into Yasaka-jina Shrine, it is full of young women dressing up in Kimano’s taking selfie’s around the shrine. It is a very colourful sight and of course I couldn’t resist my own selfie, with them. Next is the Gion district to walk around the beautifully kept narrow lanes, secretly on the lookout for Geisha’s (who usually go around in pairs). I was reading an article recently which said that Geishas have become a target of tourists mobbing them wanting selfies’. This has made them more reluctant to move freely around as they have done in the past. Our second day in Kyoto starts with a train ride then a walk to Tofuku-ji, a little visited Temple complex then onto Kiyomizu-dera Temple. We were fortunate to witness a magical ceremony with monks (of all ages) all dressed in their robes of many different colours. They marched into a courtyard one by one to local women (dressed in black) singing. It seemed as though they were ranked according to their seniority. It felt surreal with all the monks, in perfect lines, walking somberly from the entrance (where we standing) to another temple. Tomoko, our guide lead us through narrow streets and alleys before starting to climb the northern slope of Mt. Inari, home of Fushimi-Inari Taisha. Here, we entered a world of vermillion torii (Shinto shrine gates), hidden shrines, strange stone figures and, according to some, legions of ghosts and spirits. The endless red torii gates weaved up and down the slopes and it was a beautiful thing to walk through them on the cobbled stones. Something that I had always wanted to do every since living and teaching English in the northern part of Honshu Island back in 2003. We found a little artists café to have coffee and sit down after all the walking. We were lead into a tatami room with tables and cushions to sit on. The room overlooked the garden which was very green and overgrown but seem to match the whole place. It was perfect natural picture to frame the perfect room or was it the other way around . We all oh-ed and ah-ed about this gorgeous setting. The coffee turned out equally as good and the matcha (green) tea cake was to die for also. I can now see why Kyoto gets 50 million visitors per year. 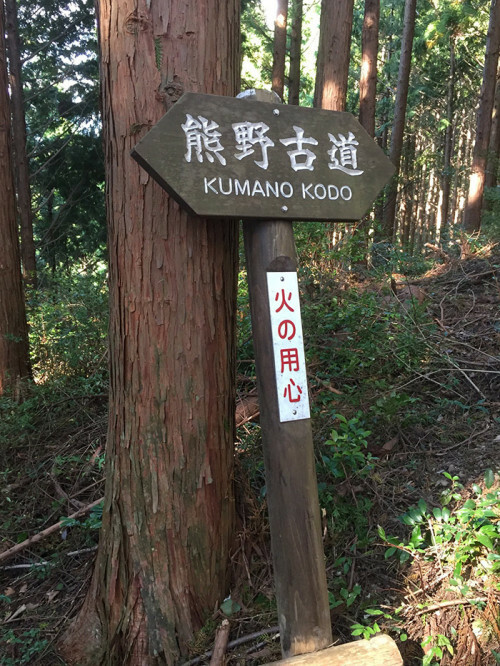 Next morning, it was time to head south to our next destination, Kii Tanabe, the first point of call for our Kumano Kudo Walk. The ancient pilgrimage trail is of the Emperors and UNESCO World Heritage protected. We arrive and head immediately to the office to get our last minute instructions for the walk. It is well organized for tourists, with locals speaking English and handing out extensive maps and bus timetables to get us around. We also receive our Dual Pilgrim books to collect stamps along the Kumano Kudo. The Kumano Kudo and the Way of St James in Spain (Camino de Santiago) are both UNESCO World Heritage pilgrim’s networks and came together to share knowledge to respect each others’ unique spiritual and cultural heritage. That evening we decide to head into town for a bit of local cuisine and ended up in a tiny restaurant/bar. Our waitress had limited English but she didn’t need any as she was the most outgoing person we had come across on our travels. She ordered food for us, bought us beers and oolong tea and generally entertained us, only to meet her at the train station the next morning. She was very excited to see us again. Kartson gave her a small koala bear souvenir which she screamed and clapped her hands in delight. We left by bus for the start of the walk, having left our bags back at the hotel to be delivered to the next destination. 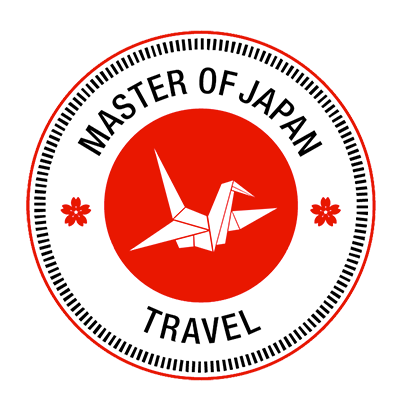 One of the great advantages of travelling in Japan, is having Takkyubin or luggage delivery services which we took full advantage of. Our plan was to get the bus and start walking at Takijiri. We arrived and headed up the mountain, our map telling us we had a 300 metre climb but only 4kms till our next destination, Takahara. The route was made of stones and steps and straight up. We grunted and groaned most of the way, stopping to catch our breath and admire the tall trees in the ancient forests as we went. It was welcome relief to get to Takahara to stop, catch our breath and admire the scenery from Takahara. We found an outdoor café that served the most delicious homemade cakes which bought a smile to our faces. Onwards we pressed, though equally beautiful old growth forests up and more up then down and more down, arriving at Chikatsuyu by around 5pm. Our brochure told us it that we walked 13kms but our fit bits and phones told us we had actually walked double of that. We decided the next day to do a shorter walk and given that some of us had a few blisters and sore legs from the mammoth first day. We caught an early bus to Hosshinmon-oji and the plan was to walk to main temple of Kumano Hongu Taisha. We started in an old growth forest which eventually gave way to open fields and houses. People were selling their wares on covered tables outside their homes. The goods ranged from salted plums, mulberries and knick knacks. Most of the produce was sold on an honesty system where we put our money in the box. Some of the villagers came out to greet us and take our money. It was a very enjoyable way to spend the day in the fresh air with easy walking. We reached the very old temple of Hongu Taisha and wandered around. It was Saturday and there were many local people visiting the temple and a cultural performance to sit and absorb. We also visited the very large Ura-torii which rises up out the rice fields with stark majestic splendor. We headed to Yunomine-oji, an onsen (hot bath) town where we would be spending the night. Being an onsen (hot bath town) were excited to get there and soak our weary bodies into the hot, sulphuric water. Yaki and I decided to go native and each have a communal bath in the town while the others soak in the onsen next door to where we were staying which was set in the river. Our hostess for our nights’ stay presented us with a beautiful dinner and she had made us special buiscuits wrapped in cellophane. As a group we decided to take the bus to our final destination Kumano Nachi Taisha Shrine and Nachi Falls. The temple complex at Nachi is one of the best places to see the blending of the older Shinto religion with newer Buddhist practices. The main worship halls for each are immediately adjacent to one and other. It is immediately obvious how this location became a focus for the veneration of nature that is common to both religions. Pilgrims have been coming to view the Nachi waterfall — the tallest in Japan –since well before either religion was an established presence. 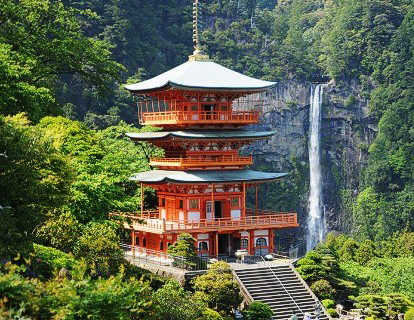 The photogenic pagoda with the waterfall in the background was the final destination for our Pilgrimage. We headed to Ki Katsuura where we would be staying the night. It is a beautiful fishing village and on finding our Ryokan found out that we could go to the onsen across the harbour if we dressed up in the Yukata’s, complete with local slippers and green bags from our rooms. The green bags were our passports to get a free ride across the bay and a free onsen. It was in a cave and fronted onto the ocean. What an experience, sitting in the hot tub watching the wave’s crash over the wall of rocks just near you. Our final dinner was made up of local fresh seafood and lots of local delicacies. A fitting way to end a magical trip. 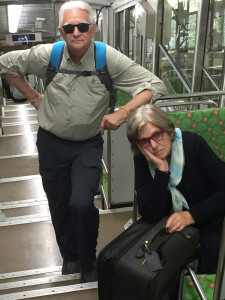 We weren’t ready to head home yet and we were all off to Tokyo taking a few days break – having completed 167,000 steps according to my phone but that’s another story. 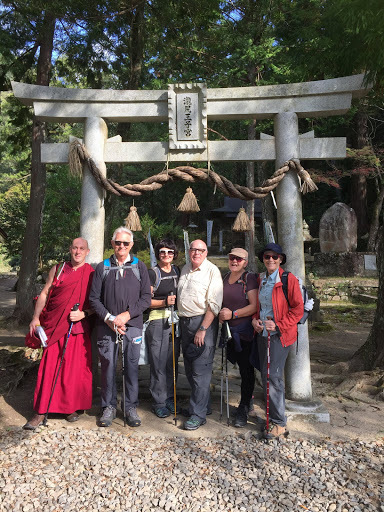 Thanks to Venerable Kartson (Yaki) for his valuable insights, research on Shingon Esoteric Buddhism, meditations and a whole lot of travel fun and Rob, Paula, Pam and Phil and Lesley to share the journey and being good travelling companions. I’m looking forward to doing it all again next year. Pilgrimages are a part of nearly every religion. When followers set out on a spiritual journey there is the hope of finding virtue and gaining merit. For Buddhists, there is the focus of visiting places where a spiritual master once spent time, taught or meditated – and this presence is often felt by those who visit that very place. The four most significant pilgrimage sites for Buddhists are – Lumbini in Nepal (where the Buddha was born), Bodhgaya (where the Buddha attained enlightenment), Dhamekh Stupa in Sarnath (the place of the first turning of the wheel after the Buddha was enlightened) and Kushinagar (where the Buddha died or entered Parinirvana). The last three places are all in India, making it a very significant pilgrimage location for Buddhists. 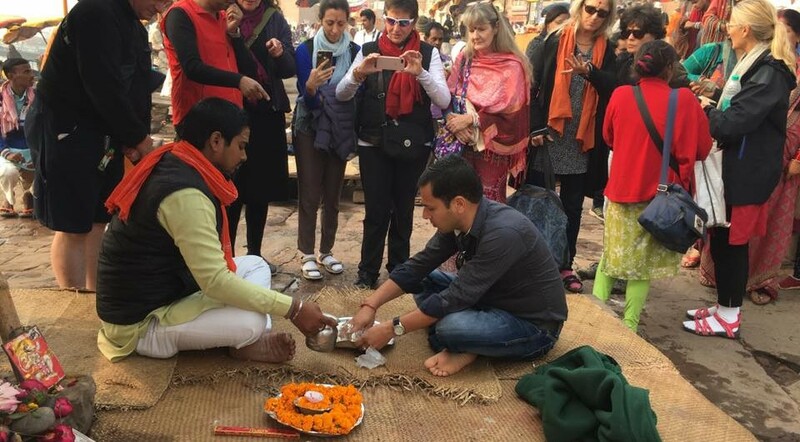 I have been on and lead many pilgrimages, mainly in India and Nepal, and find them very powerful experiences. I have found my visits to Bodhgaya especially enlightening. This is where the Buddha meditated under the Bodhi Tree at Mahabodhi Stupa and became enlightened some 2500 years ago, making it the most sacred place in the world for Buddhists. The main focus of Bodhgaya is the magnificent Mahabodhi Stupa. Buddhists travel from all around the world to circumambulate (the act of moving around a sacred object or idol) the Stupa in a clockwise manner or to sit and meditate under the actual Bodhi Tree. Even when just generally sitting in the enclosure people report feeling the vibrations from the Stupa. Every step and movement of the pilgrim becomes filled with a sense of spiritual progress, just by visiting the Stupa. Bodhgaya is the most powerful Buddhist pilgrimage site in the world and is visited by Buddhists from many countries – in particular by people from the Himalayan regions of Tibet, India and Bhutan. Pilgrims also visit from as far afield as Thailand, Sri Lanka, Myanmar, Cambodia and Laos in the hope of receiving blessings for the highest achievements of their spiritual path. When the Dalai Lama first visited the Mahabodhi Stupa in 1956 he wrote ‘when I finally stood in the presence of the seat of enlightenment, I was profoundly moved. Reflecting on Sakyamuni Buddha’s great accomplishment in this place, I also could not fail to remember his overwhelming kindness to all sentient beings.’ These powerful and enlightening thoughts are within reach for all who visit this spiritually significant site. A trip to India and Nepal is usually on every Buddhist’s bucket list. 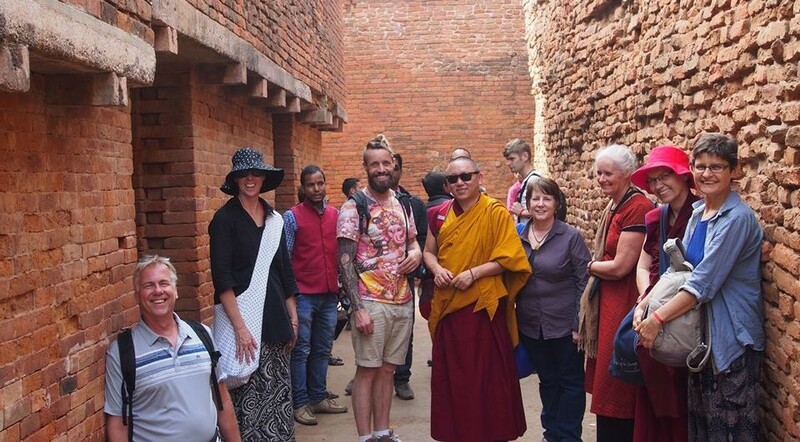 You can take a pilgrimage with an organised group as the main four Buddhist sites are within driving distance from each other (you will need around 5 days to do this). The best time to travel is during the winter season between October and March each year. Other famous sacred places for Buddhists include other parts of India, including Ajanta and Ellora Caves (see above) , South India, Mount Kailash in western Tibet, Borobudur in Indonesia, Anuradhapura in Sri Lanka, Nara in Japan, Angkor Wat in Cambodia and Shwedagon Pagoda in Myanmar. Buddhists believe that merit is accumulated when you take part in something religious, with discipline and faith, because in doing so you shape a proper attitude within. So with the right attitude, any journey to a sacred place can become a pilgrimage. 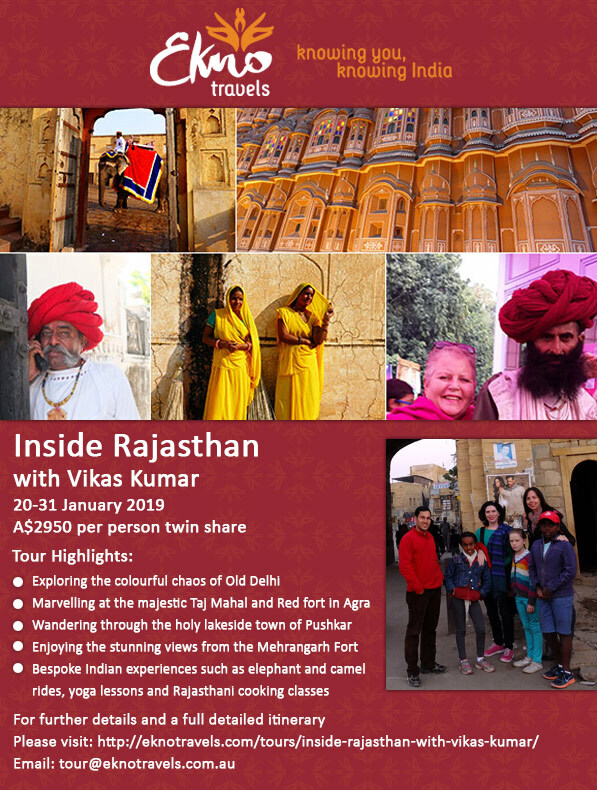 Beautiful Rajasthan with our insider, Vikas Kumar. Highlights include the Jaipur Literature Festival (billed as the Greatest Show on Earth). The Dalai Lama’s teachings in Dharamsala are up there on one of the all time experiences to put on your bucket list. It has a famous person at centre stage – the Dalai Lama, all the pomp and ceremony of an ancient culture, lots of Tibetans from the Amlas (mothers, grandmothers) and their children and grandchildren in their long, silk brocade tunic with a matching (or not) blouse underneath. The men are also there in their traditional extraordinary, long armed coats covering their trendy jeans. All this is decorated with silver amulets, coral and turquoise beads. It is interesting mixture of the traditional versus modernity of jeans, t-shirts and American sports shoes. The teachings which are on Buddhist Philosophy can be difficult to understand. The Dalai Lama is a very skilled teacher who has spent a lifetime absorbed in this ancient Philosophy, cuts through it all, and gives very practical advice on how to use it in everyday life. He has the uncanny ability to tell us when we need and feel as though he is talking to us directly. With his deep, powerful voice the words that are delivered cut deep into your heart and soul. The audience for the teachings is a mixture of cultures, ages and races. 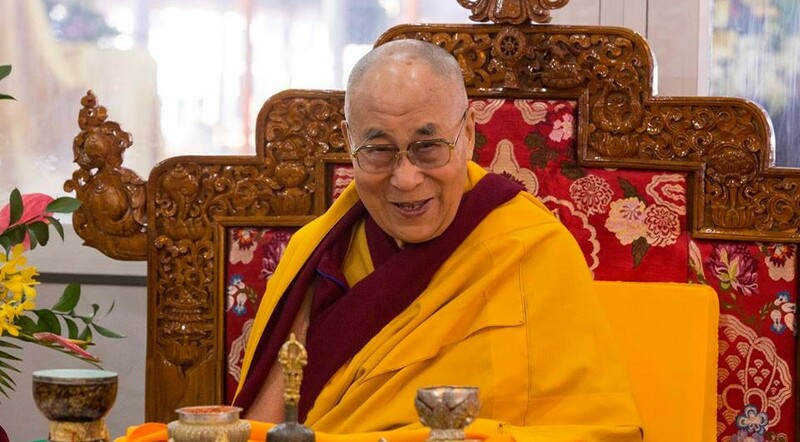 From the local Tibetans to people who have travelled far and wide to be in the Dharamsala temple grounds it is an eclectic mix who all come for one common purpose, to get a glimpse to the Dalai Lama and to hear his words. The teachings happen in his temple grounds. There are no chairs (you have to bring your own) and the teachings are in Tibetan with the language of your choice through an FM radio. As it is in an open space, the teachings can happen in all kinds of weather; it can be either freezing cold or blistering hot. It is also a huge, cultural experience. Tibetans treat it as a special occasion and dress up for it and sit, listen and socialize in the breaks. The kids run around as if they are at a picnic. The Dalai Lama comes and goes to his house in the same way, through the gates at the end of the temple. If you are cheeky enough, you can manaevour your way to the front and get up close and personal with him (surrounded by his body guards though). It can be a very moving experience particularly making eye contact and having him stop to talk to you and your neighbours. We, at Ekno Travels are locals of Dharamsala, so we have put together 2 itineraries to coincide with the 2018 teachings in 4-7 September, 3-6 October 2018 See itinerary here. Hope you can join us.